John Hagee, founder and pastor of the 15,000-member Cornerstone Church in San Antonio, authored the book Beginning of the End which became a New York Times bestseller. Hagee references a report from the National Earthquake Information Center of the U.S. Geological Survey: "
." and notes within the government report "
. "10 Remarkably, Hagee goes on to contradict directly the government report: "
In light of such slipshod documentation, we are concerned about the widespread claim within the Christian community that earthquakes are on the increase. Can these recent statements be supported by rigorous documentation? Or have the deployment of more seismographs during the last few decades made detection and cataloging of earthquakes more complete, thereby enhancing the perception of increase? Does the public have the perception that earthquakes are on the increase because earthquakes now afflict our larger urbanized populations, and, therefore, are more often reported by the media? We believe the public perception and media characterization promotes the self-sustaining "urban legend" even among the Christian Church.14 This "legend" widespread in western culture regards earthquakes of the twentieth century to be on the increase. We will cite data that directly confront the urban legend. 1 Hal Lindsey, Apocalypse Code (Palos Verdes, CA: Western Front Ltd., 1997), p. 296. The term "killer quake" is not defined. See also Hal Lindsey, Planet Earth 2000 A.D. (Palos Verdes, CA: Western Front Ltd., revised edition, 1996), p. 85, where Lindsey says these statistics refer to earthquakes of magnitude 6.0 and greater. Lindsey has been writing about the twentieth century increase of earthquakes for almost 30 years. See his book The Late Great Planet Earth (Grand Rapids: Zondervan, 1970), p. 52, that sold over 20 million copies. 2 Lindsey, Planet Earth 2000 A.D., p. 86. Table 1 lists Lindsey's earthquake statistics. 3 Lindsey's citation here is suspicious. Though he claims to be using a USGS source, his endnote (p. 105) refers only to the Los Angeles Herald Examiner, May 22, 1984. One wonders how a newspaper published early in 1984 could provide data for an increase in earthquakes in the 1980s and 1990s. 5 Grant R. Jeffrey, Prince of Darkness (Toronto: Frontier Research Publications, 1994), pp. 310, 311. Jeffrey gives no information on how a copy of this report can be obtained (author, date, report name, and location). Furthermore, the numbers from Jeffrey's USGS source differ slightly from Lindsey's USGS source. Which is the better USGS source? Jeffrey repeats these statistics in his later books The Signature of God (Toronto: Frontier Research Publications, 1996) p. 194, and Armageddon: Appointment with Destiny (Toronto: Frontier Research Publications, revised edition, 1997), pp. 251, 252. In Armageddon (p. 252) Jeffrey is very confident in his earthquake statistics: "Anyone who examines the record of massive increases in earthquakes in our century must acknowledge that this is extremely unusual. The increase is unprecedented in recorded human history and, in light of the Bible's prophecies, these statistics provide incontrovertible evidence that we are living in the last days. 6 J. R. Church, "Riders of Revelation 6, Mount Up!," in William T. James, Foreshocks of Antichrist (Eugene, Harvest House, 1997), p. 336: "Nevertheless, when one looks at modern records, one invariably sees a steady increase in earthquake activity, ranging across the spectrum from large events to small tremors. 7 Gary Stearman, "Are Earthquakes on the Increase?" Prophecy in the News 16 (June 1996): pp. 3-5. These are the numbers cited by Lindsey. 8 We searched the archive of the Philadelphia Inquirer on July 22, 1998 on the Internet at URL: http://www.phillynews.com. We searched all earthquake articles of the 1990s through June 1998. 9 Gary Stearman, "Earthquakes Are Indeed on the Increase," Prophecy in the News 16 (October 1996): pp. 27, 28. 10 John Hagee, Beginning of the End (Nashville, Thomas Nelson Publishers, 1996), p. 193. 11 Hagee, Beginning of the End, p. 193. 12 Hagee, Beginning of the End, p. 193. Hagee, Beginning of the End, p. 98, "
the number of earthquakes recorded has risen from 2,588 in 1983 to 4,084 in 1992." Here Hagee has committed a serious error by citing the "No Magnitude" row in the National Earthquake Information Center (NEIC) worldwide seismic frequency table. He supposes erroneously that the "No Magnitude" row is the total number of earthquakes that have been located globally for both of the years. The NEIC "Preliminary Determination of Epicenters" database (PDE) for 1983 locates 9,842 events globally (2,588 events with no magnitude data given), and that database for 1992 locates 19,548 events globally (4,084 events with no magnitude data given). 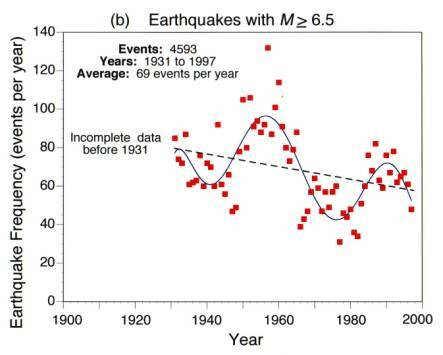 The apparent doubling of earthquake frequency from 1983 to 1992 is caused by significant improvement by 1992 in the detection and location of magnitude less than 5.0 earthquakes. For magnitude greater than or equal to 5.0, the PDE locates 1813 events in the year 1983, but locates only 1668 events in 1992. For magnitude greater than or equal to 6.0, the PDE locates 140 events in 1983, but locates only 127 events in 1992. The data might better argue for decreasing frequency with time, contrary to the conclusion of Hagee. The above numbers were obtained on November 28, 1998 by going to the NEIC files on the Internet at http://wwwneic.cr.usgs.gov and then going to the NEIC-PDE data using the "Search Earthquake Data Base" function. The earthquake data file cited by Hagee contains the cautionary statement, "As more and more seismographs are installed in the world, more earthquakes can be and have been located." See the summary NEIC-PDE data file at: http://wwwneic.cr.usgs.gov/neis/eqlists/eqstats.html which closely resembles the source of Hagee's numbers. Therefore, our analysis shows Hagee's argument for increased earthquake frequency in the 1990s to be seriously flawed. Charles Capps in End-times Events-Journey to the End of the Age (Tulsa, Harrison House, 1997) commits a similar error by citing the much-increased lower-magnitude location ability within the most recent NEIC data: "A recent U.S.G.S. report shows there were 4,139 earthquakes in 1970 -and 19,996 in 1996." Capps concludes, "...earthquakes are definitely on the increase." (p. 13). 13 Peter and Paul Lalonde, 301 Startling Proofs & Prophecies (Niagara Falls, ONT: Prophecy Partners Inc., 1996), p. 248. The Lalonde earthquake frequency numbers have been widely quoted in popular publications. For example, we found the above Lalonde quote reprinted in Daymond R. Duck, Revelation: God's Word for the Biblically-Inept (Lancaster, PA: Starburst Publishers, 1998), p. 242. The Lalonde statistics were rephrased by Jack Van Impe, "Last Days: Hype or Hope?," Perhaps Today (September, October 1996), viewed on August 20, 1998 on the Internet at http://205.244.46.136/PerhapsToday/SeptOct1996/last.html. Van Impe says: "In Matthew 24, Jesus predicted such fearful signs just before His return. He said they would be like birth pangs - increasing in frequency and intensity as the time of the end drew near.... From 1900 through 1969, a 70-year period, there were only 48 quakes of 6.5 magnitude or greater. But from July 1990 through 1992, a three-year period, there were 133 great quakes!" For other statements about the apocalyptic increase of earthquakes in the 1990s see David Allen Lewis Signs of His Coming (Green Forest, AR: New Leaf Press, 1997): "
. Every 10 years, earthquakes double in number, and so it has been for the last 10 decades. During the later part of this decade, earthquakes will occur with increasing regularity, creating terror and panic throughout the world. Jesus said that was one of the signs of His coming." If earthquakes are increasing so rapidly in the 1990s, then what is there to prevent Christ's return? Therefore, in Larry Wilson, The Revelation of Jesus (Brushton, NY: Teach Services, 1992), p. 1, we find the former Seventh-day Adventist pastor predicting four global earthquakes beginning about 1994 and ending in 1998 with the Second Coming of Christ. 14 For a recent survey of thinking on earthquakes and other natural disasters as apocalyptic signs see Richard Abanes, End-time Visions: The Road to Armageddon? (Nashville, Broadman & Holman, 1998), 428 p. For a review of authors before the 1990s who advocated the increase in frequency and intensity of twentieth-century earthquakes see the chapter "Earthquakes and Historical Facts" in Carl O. Jonsson and Wolfgang Herbst, The "Sign" of the Last Days - When? (Atlanta: Commentary Press, 1987), pp. 46-87. 15 Interested researchers can investigate the Council of the National Seismic System (CNSS) composite catalog on the Internet at http://quake.geo.berkeley.edu/cnss. 16 O. J. Perez and C. H. Scholz, "Heterogeneities of the Instrumental Seismicity Catalog (1904-1980) for Strong Shallow Earthquakes," Bulletin of the Seismological Society of America 74 (1984): p. 685. 17 An incident illustrates why earthquake catalogs need to be checked carefully for completeness. In 1997 we consulted the "Worldwide Earthquake Catalog" maintained by the Council of the National Seismic System (CNSS) for seismic events of the 1990s. The CNSS "Worldwide Earthquake Catalog" was examined at http://quake.geo.berkeley.edu/cnss on November 28, 1997. Because this is a composite database assembled from the records of the thirty member organizations, we might assume it to be a "complete" catalog. However, when we consulted records maintained by CNSS member organizations, we found them to include earthquakes not in the composite database. We even found many earthquakes of the early 1990s with M ³ 7.0 that were not in the composite database. The lesson is obvious: careful study must be conducted before an earthquake catalog can be said to be "complete." It takes a deliberate process to make a "complete" catalog. 18 T. M. Tsapanos and P. W. Burton, "Seismic Hazard Evaluation for Specific Seismic Regions of the World," Tectonophysics 194 (1991): p. 154. 19 Tsapanos and Burton, "Seismic Hazard Evaluation for Specific Seismic Regions of the World," p. 154. 20 K. Abe, "Complements to 'Magnitudes of Large Shallow Earthquakes from 1904 to 1980'," Physics of the Earth and Planetary Interiors 34 (1984): pp. 17-23. 21 For an excellent summary of earthquake magnitude scales see W. Spence, S. A. Sipkin and G. L. Choy, "Measuring the Size of an Earthquake," Earthquakes and Volcanoes 21 (1989): pp. 58-63. The paper has been posted on the Internet at http://wwwneic.cr.usgs.gov/neis/general/handouts/measure.html. 22 An Internet site with National Earthquake Information Center databases and summary files is open to the public. The Internet URL for the NEIC home page is http://wwwneic.cr.usgs.gov. 24 National Oceanic & Atmospheric Administration, Seismicity Catalog (Boulder, CO: National Geophysical Data Center, 1996), two volumes on CD-ROM disks. A description and current updates to the "Worldwide Earthquake Database" and its Seismicity Catalog are maintained on the Internet at http://www.ngdc.noaa.gov/seg/hazard/earthqk.html. 25 The file "1900.EQ" is part of the global NGDC "Seismicity Catalog" on CD-ROM. The data file has not been screened rigorously for duplicate events below magnitude 6.5, and some of the events of lower magnitude, which normally might be supposed to be aftershocks or foreshocks, are likely duplicated listings. Therefore, the data file "1900.EQ" probably overestimates the frequency of magnitude 6.0 events globally. 26 K. Abe, "Magnitudes of Large Shallow Earthquakes from 1904 to 1980," Physics of the Earth and Planetary Interiors 27(1981): pp. 72-92. K. Abe and S. Noguchi, "Determination of Magnitude for Large Shallow Earthquakes 1898-1917," Physics of the Earth and Planetary Interiors 32 (1983): pp. 45-59. K. Abe and S. Noguchi, "Revision of Magnitudes of Large Shallow Earthquakes, 1897-1912," Physics of the Earth and Planetary Interiors 33 (1983): pp. 1-11. K. Abe, "Complements to 'Magnitudes of Large Shallow Earthquakes from 1904 to 1980'," Physics of Earth and Planetary Interiors 34 (1984): pp. 17-23. 27 K. Abe and H. Kanamori, "Temporal Variation of the Activity of Intermediate and Deep Focus Earthquakes," Journal of Geophysical Research 84 (1979): pp. 3589-3595. 28 J. F. Pacheco and L. R. Sykes, "Seismic Moment Catalog of Large Shallow Earthquakes, 1900 to 1989," Bulletin of the Seismological Society of America 82 (1992): pp. 1306-1349. 29 T. M. Tsapanos, E. M. Scordilis and B. C. Papazachos, "A Homogeneous and Complete Catalog for World's Great Earthquakes Covering the Time Period 1898-1985," Publication of the University of Thessaloniki, Geophysics Laboratory (1988): p. 182. 30 The NGDC statistics come from the file "1900.EQ" contained in volume 2 of the CD-ROM called "Seismicity Catalog" issued in 1996 jointly by the NGDC and the NEIC. Anyone wishing to evaluate completeness of earthquake statistics globally for M ³ 6.0 cited by prophecy teachers should consult this file. The file is in ASCII code that can be read by any word processor and imported into a spread sheet. Because the file "1900.EQ" is not copyrighted, the authors can make a copy available on floppy disk to anyone requesting it. 31 Abe and Kanamori, "Temporal Variation of the Activity of Intermediate and Deep Focus Earthquakes." J. Xanthakis, "Possible Periodicities of the Annually Released Global Seismic Energy (M ³ 7.9) during the Period 1898-1971," Tectonophysics 81 (1982): pp. T7-T14. Y. Ogata and K. Abe, "Some Statistical Features of the Long-Term Variation of the Global and Regional Seismic Activity," International Statistical Review 59 (1991): pp. 139-161. I. Liritzis and T. M. Tsapanos, "Probable Evidence for Periodicities in Global Seismic Energy Release," Earth, Moon, and Planets 60 (1993): pp. 93-108. Y. Ogata and K. Katsura, "Analysis of Temporal and Spatial Heterogeneity of Magnitude Frequency Distribution Inferred from Earthquake Catalogues," Geophysical Journal International 113 (1993): pp. 727-738. 32 Researchers suggest the inhomogeneity of earthquakes may be related to some type of internal global fluctuation within the earth, perhaps a variation in the large-scale motion of the earth. Could a slight wobble during the earth's rotation correlate with the inhomogeneous data? Is there occasional chaotic motion within the earth's liquid outer core that correlates with earthquakes in the crust? Earthquake frequency cycles appear to be real, but the cause remains speculative. An observer might say it is like monitoring birth pangs. When will the next ones come? How long will we have to wait? The observed earthquake frequency pattern is consistent with creationist ideas suggesting overall exponentially declining tectonism and volcanism following a recent geologic upheaval such as Noah's Flood. The data may present a problem for the skeptic of the doctrine of Creation and the opponent to the reality of Noah's Flood. Such a uniformitarian skeptic would want to say, "everything goes on as it has since the beginning of creation" (2 Peter 3:4 NIV). The skeptic might not want to acknowledge such a declining pattern over time. 33 M. Zirbes, "Are Earthquakes Really on the Increase?" National Earthquake Information Center Web site Documents (Denver, CO: United States Geological Survey, updated 14 October 1997). This document was viewed in November 1997 at http://wwwneic.cr.usgs.gov/neis/general/handouts/increase_in_earthquakes.html. 34 Lindsey, Planet Earth 2000 A.D., p. 88. 35 Lindsey, Planet Earth 2000 A.D., p. 88. 36 Lindsey, Planet Earth 2000 A.D., p. 89. "By selectively manipulating the criteria used to determine a 'major quake,' the USGS can effectively argue against any increase in seismic activity." Lindsey's assertion of selective manipulation is demonstrated to be incorrect by data displayed in Figure 1b. 37 Lindsey's statistics for M ³ 6.0 earthquakes in Table 1 come from Planet Earth 2000 A.D., p.85,86. 39 Stearman, "Are Earthquakes on the Increase?" 40 Lalonde and Lalonde, 301 Startling Proofs & Prophecies, p. 248. 41 Lindsey, Planet Earth 2000 A.D., p. 86. On page 85 Lindsey says: "One of the major birthpangs Jesus predicted would increase in frequency and intensity shortly before His return is earthquakes. Those of us who live in California are only too aware of the increase in earthquake activity in recent years." 42 Our computer search of "authoritative" records revealed the date, location and magnitude of 408 earthquakes with M ³ 5.0 during the eighty-year period from 1900 through 1979 in the California region. We located these authoritative records for M ³ 5.0 by accessing the "U. S. Geological Survey Earthquake Data Base" of the NEIC on the Internet at http://wwwneic.cr.usgs.gov. For the period 1900 through 1974, we searched at the NEIC website the California Division of Mines and Geology catalog ("CDMG") and located 364 earthquakes. For the period 1975 through 1979, we searched by rectangular areas the Preliminary Determination of Epicenters catalog ("PDE") and found an additional 44 earthquakes. Our search was conducted totally within the NEIC database for M ³ 5.0 records on August 28, 1998. 43 R. Stein and T. Hanks, "M ³ 6.0 Earthquakes in Southern California during the Twentieth Century: No Evidence for a Seismicity or Moment Deficit," Bulletin of the Seismological Society of America 88 (1998): pp. 635-652. Their catalog can be accessed through the Internet at http://quake.wr.usgs.gov/study/deformation. 44 L. K. Hutton and L. M. Jones, "Local Magnitudes and Apparent Variations in Seismicity Rates in Southern California," Bulletin of the Seismological Society of America 83 (1993): pp. 313-329. Hutton and Jones document 63 M ³ 5.0 events in Southern California from 1932 through 1979, many more than the 18 events for all of California that Lindsey supposes from 1900 through 1979. 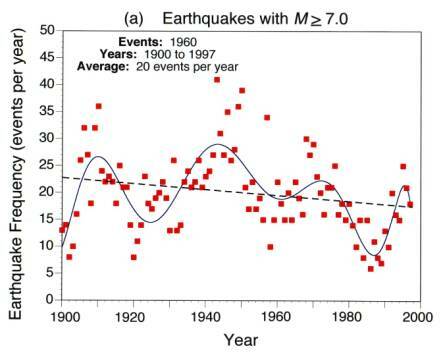 45 Stein and Hanks, "M ³ 6.0 Earthquakes in Southern California during the Twentieth Century: No Evidence for a Seismicity or Moment Deficit," p. 635. 46 In Planet Earth 2000 A.D. (page 85), Lindsey refers to a recent earthquake increase in Japan: "But California is not the only place where earthquake activity has increased. There has been a destructive series of quakes in Armenia, Australia, Japan, China, India as well as California." 47 T. Utsu, "Catalog of Large Earthquakes in the Region of Japan from 1885 through 1980," Bulletin of the Earthquake Research Institute, University of Tokyo 57 (1982): pp. 401-463 (in Japanese). 48 Y. Ogata and K. Abe, "Some Statistical Features of the Long-Term Variation of the Global and Regional Seismic Activity," International Statistical Review 59 (1991): pp. 139-161. 49 Ogata and Abe, "Some Statistical Features of the Long-Term Variation of the Global and Regional Seismic Activity," p. 131. 50 Cf. The Late Great Planet Earth, p. 52, where he writes that Jesus said these signs "would increase in frequency and intensity just like birth pangs before a child is born." 51 Although in 1 Kings 19:11 the point is that God did not speak in the earthquake, the expectation is that he normally would have. The gentle whisper is contrasted with God's more typical theophanic manifestation of power. 52 For summaries of the various views see D. A. Carson, "Matthew," in The Expositor's Bible Commentary, Vol. 8, ed. Frank E. Gaebelein, (Grand Rapids: Zondervan, 1984), pp. 491-495; J. Dwight Pentecost, Things To Come. A Study of Biblical Eschatology (Grand Rapids: Zondervan, 1964), 277-278. 53 See Pentecost, Things To Come, pp. 278-279; idem, Thy Kingdom Come (Grand Rapids: Zondervan, 1990, pp. 250-252; L. Barbieri, "Matthew," in The Bible Knowledge Commentary. New Testament (eds. J. Walvoord & R. Zuck, Wheaton: Victor, 1983), pp. 76-77. A modification of this interpretation extends the first half of the tribulation to verse 14. 54 See Pentecost, Things To Come, pp. 278-279. 55 L. S. Chafer, Systematic Theology (Dallas: Dallas Seminary Press, 1948), p. 120. 56 J. Walvoord, The Bible Knowledge Handbook (Wheaton: Victor, 1990), p. 381. While Walvoord is here describing various views (not identifying his own), this view is also expressed in his commentary on Matthew: Matthew. Thy Kingdom Come (Chicago: Moody, 1974), p. 184. 57 Walvoord, Bible Knowledge Handbook, pp. 382-383. 58 Josephus describes an interesting episode which occurred following a severe earthquake in Judea in 31 B.C., an earthquake which reportedly killed 30,000 people. Hearing exaggerated reports of the devastation, the Arabs to the East seized the opportunity and invaded the territory of Herod the Great, embroiling his nation in war. When many of Herod's demoralized troops interpreted the earthquake as an evil omen, Herod responded with a speech declaring it to be an event without divine causation: "Do not let the convulsions of inanimate nature disturb you or imagine that the earthquake is a portent of a further disaster. These accidents to which the elements are subject have physical causes, and beyond the immediate injury inflicted bring no further consequences to mankind." (Josephus, War, 1.19.4 [§376-377]; tr. H. St. J. Thackeray, Loeb Classical Library; Cambridge: Harvard UP, 1961). 59 Donald A. Hagner, Matthew 14-28 (Word Biblical Commentary 33B; Dallas: Word, 1995), p. 691. 60 J. F. Walvoord, Matthew, p. 184. 61 For references see G. Bertram, Theological Dictionary of the New Testament, Vol. 9, ed. G. Friedrich; tr. and ed. G. W. Bromiley (Grand Rapids: Eerdmans, 1974), pp. 670 ff. ; Hagner, Matthew 14-28, p. 691. * Steven A. Austin is Chairman of the Geology Department at the Institute for Creation Research in Santee, California. Mark L. Strauss is Associate Professor of New Testament at Bethel Seminary San Diego in San Diego, California.